There are good reasons to sell your car privately. It’s often the quickest way to get rid of an unwanted vehicle, and one of the best ways to get a competitive price, leaving you – as the owner – in control of the process. However, when you’re responsible for the whole end-to-end selling process, it’s worth being aware of a few key things to ensure a smooth, pain-free transaction. You should also be wary of encountering fraudulent buyers and scammers looking to exploit inexperienced sellers. In this blog, we’ll cover some top tips to ensure you stay safe, get the best deal, and avoid potential problems when selling your car. Long before you begin to seek potential buyers, there are lots of things you can and should do to set yourself up for success. Before considering advertising, it’s a useful practice to put yourself in the buyer’s shoes. Consider a potential buyer’s viewpoint – what information would you be looking for in a used car? This is, without doubt, the best way to start your sales process. When it comes time to advertise, you’ll want to ensure that the car you photograph and write about is as clean and tidy as possible. Every little counts: get the car washed, shine the windows, polish the dashboard and throw an air freshener in! Surveys suggest that at least one in five Brits would pay less for an unclean car. If you have the time and can afford the expense, consider what extra effort you can make to boost your car’s sales prospects. Topping up your oil and water levels, ensuring tyre pressure is adequate, replacing missing wheel trims – all these things will contribute to the appearance of a well-tended vehicle. Be honest about what you find, damages and defects included. Most buyers are looking for a vehicle that’s well cared for, and will check first for signs of wear and tear before making an offer – whether you’ve reported it or not. It’s best to be upfront. Avoid obscuring the facts and frustrating potential buyers. In advertising, photographs are extremely impactful – so much so that car listings without photos are largely ignored by would-be customers. Taking lots of photos from multiple different angles (ideally well-lit, high quality images) will help buyers to understand the true condition of the vehicle and, hopefully, reduce many of their concerns. Whenever transferring ownership of a car from one person to another, it’s good practice to have all your paperwork ready. That includes the car’s registration document, MOT certificate and service history or logbook. Being able to see a vehicle’s full service history is extremely valuable to any would-be buyer – the more the buyer knows, the fewer reservations they will have. The used car market is competitive, leaving very little wriggle room to find a true bargain. It’s important to aim for a reasonable price that will entice buyers, but not so low as to cause suspicion. A good way to get an estimate of your vehicle’s value is to search online for similar models and makes. Remember: your potential customers are likely to compare prices themselves, so it may be beneficial to stick within the common price range! It’s almost certain that your vehicle will be competing with a huge number of others for sale, so it’s important to provide these key details. Surveys have shown that most private buyers aren’t looking for flowery descriptions or marketing language, just cold facts: mileage, MOT, road tax and optional extras (such as in-car entertainment). If you’ve covered all of the above steps, it should only be a matter of time before somebody enquires about your car and wants to arrange a viewing. It’s essential to be prepared with some basic best practices. Here we also provide some tips to keep in mind, just in case you come across an opportunistic scammer looking for their next victim. When arranging a viewing with the potential buyer, aim to meet near your home if possible. There’s no place safer for you and your vehicle. Also, providing evidence of your physical address should increase the buyer’s confidence that the vehicle being sold comes from a legitimate source. It’s not uncommon for buyers to bring someone with them, sometimes for support or for extra technical insight before committing to their purchase. Bringing a friend or family member along can boost your confidence, while also being an additional insurance and helping hand if the worst should happen. A caveat it to the above point: if your buyer brings more than one friend to tag along to the viewing, there may be cause for suspicion. While you’re away on the test drive, these extras might have an opportunity to steal from you. Make sure you don’t leave anyone you don’t know unattended with your belongings. First, you should make sure the buyer is who they say they are – it is essential to ask for a proof of identity. While you’re at it, it’s never a bad idea to check that the buyer is licensed to drive with an up-to-date driver’s licence. You should make it clear that the buyer will be liable if an accident occurs during a test drive, and that they should be insured. Getting clear confirmation that they are covered to drive your car is crucial if you want to avoid problems. Contact your own insurance company as well – it’s possible you will need some form of temporary car insurance for the test drive. It’s only natural that your buyer will try to get the best deal possible. It’s important to be flexible to a degree, especially if the buyer seems serious about the purchase. At the same time, you should keep your ‘red line’ in mind, in terms of the absolute minimum you are willing to accept. If the potential buyer arrives by road, it’s not a bad idea to make a note of their vehicle’s registration – just in case they try something sneaky. For this reason, it’s also important to never leave your car or car keys alone with the buyer. Ensure that you are in the car with the buyer at all times. 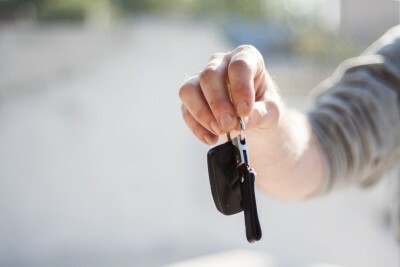 You should also be sure the keys are in your hand once the test drive is finished and you leave the vehicle. You’ve found a willing buyer, you’re sure they are who they appear to be, and they’re ready to pay for the vehicle. How do you ensure you get what you’re owed and everything goes smoothly in the transaction? To avoid the worst, it is essential that you do not hand over the car or any related paperwork until the money for the sale is confirmed to be in your bank account. Even if you have to wait for a cheque to clear, do not let the buyer drive away before you’ve received every penny. If there’s cash involved, meet the buyer directly at your bank so you can complete the process quickly. Ensure you produce two identical receipts documenting the transaction – one for you, and one for the buyer. State the price, your names and addresses, date of purchase, as well as essential details of the vehicle including: registration number, make and model. The receipt should also state the car is “sold as seen, tried and approved without guarantee”. It is your responsibility, by law, to inform the DVLA that ownership of your car has changed hands. You can do this by completing the relevant form on your V5C logbook and sending it via post, while giving section 10 of the V5C to the new car owner. You should also seek to cancel your existing insurance policy as soon as possible. Tax, however, should be automatically taken care of. We hope that the above tips will help you when considering selling your car privately. With these pointers in mind, you should be able to avoid any potential worst-case scenarios. Remember that ASM Auto Recycling will buy used cars whether roadworthy or non-roadworthy at highly competitive rates. If you’re unsure that selling privately is the right route for you, feel free to explore our range of auto recycling and car breaking services.